Ulster centre Stuart McCloskey has signed his first professional contract with the Irish province. McCloskey's deal ties him to Ulster until the summer of 2017. 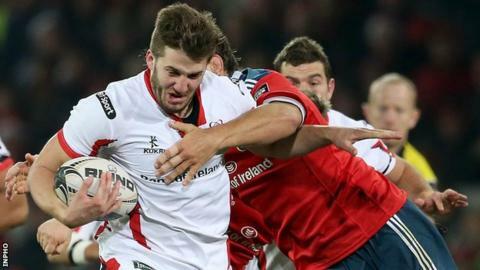 The former Bangor Grammar School pupil made his debut against the Dragons in February of last year and has made 12 Ulster appearances this season. McCloskey's Ulster form in the closing months of last season earned him selection on the Emerging Ireland squad which toured Romania in the summer. "Every young rugby player wants to play for the first team and wants to sign a professional contract and I feel very fortunate now to have done both of those things with the province that I am from and that I support," said Ulster Academy product McCloskey. "We have a fantastic group of players, great facilities and excellent coaches so signing the contract was not a difficult decision."